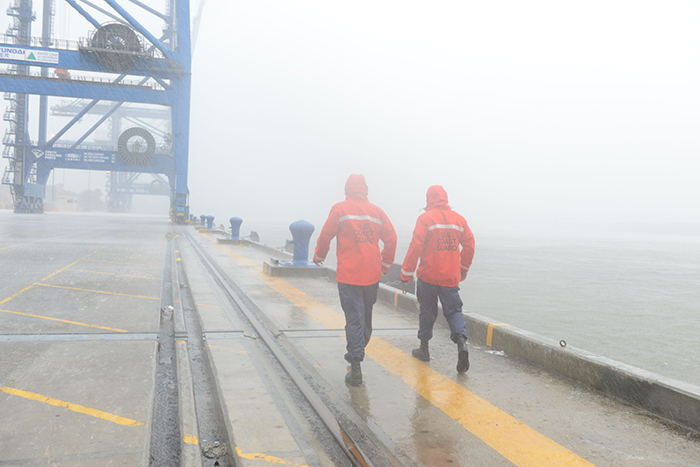 Members of the US Coast Guard inspect the Port of Charleston during Hurricane Irma. The US ports that closed ahead of Hurricane Irma’s landfall are preparing to reopen, but with fuel stores low, many still without power, and roads and rail lines in disrepair, it will be days before shippers see supply chains in Florida and the Southeast totally restored. The six major ports, stretching from Miami to Charleston, that suspended operations during the weekend handle one out of every six containers entering and leaving North America, as well as significant volumes of petroleum, diesel, and jet fuel that supply other modes of transportation in the region. Restocking fuel, in the short term, will be a priority throughout the region. “Hurricane Harvey is still sending ripples throughout the (US) market,” Daniel Cullen, vice president of advisory services at Breakthrough Fuels, said Monday. The impact on diesel supplies, however, has not been as bad as the drain on gasoline, a distinction not always made by the general media, he said. Florida’s Port Miami, Port Everglades, and Port Tampa Bay reopened Tuesday morning. The Port of Charleston in South Carolina also reopened Tuesday, after the port said it was spared the brunt of the storm. Meanwhile, the US Coast Guard was still assessing the condition of harbors at the ports of Savannah and Jacksonville, according to early morning updates. While Jacksonville remains closed, Savannah is anticipated to reopen later Tuesday or Wednesday pending that assessment. Port Everglades and Port Tampa Bay are critical for the state’s fuel supplies and Gov. Rick Scott said he prioritized opening those ports as soon as possible after the storm cleared. Although that may not be enough to support cargo hauls from distribution centers north of Florida, in cities like Atlanta and Charlotte, to population centers in South Florida. Florida remains one of the “longest” states, said Ken Harper, director of marketing at DAT Solutions. From its southernmost point to the end of the Panhandle takes more than half a day’s drive and many of the major highways are congested with residents and recovery efforts and secondary roadways are in various states of disrepair, some still blocked by felled trees and downed power lines. The spot market rates to truck goods into the state have been up significantly as a result, said Montague. Drivers are willing to make the trek, at least from Atlanta and Charlotte into Central Florida, but for a price. According to DAT Solutions, spot rates from Charlotte to Lakeland, Florida last week were up 36 cents to $2.89 per mile and rates from Atlanta to Lakeland were up 25 cents to $2.94 per mile. It’s not only rates in the Southeast that have been impacted by this year’s hurricane season. The Chicago-to-Buffalo lane was up 82 cents to a lane average of $3.30 per mile last week. “Now, that’s unusual even in the spot market,” said Montague. The widespread rate increases is a result of how integrated the US landside supply chain has become. After Harvey pummeled the Gulf Coast three weeks ago now, Southeast distribution centers led by Atlanta began supplying the Gulf region. Because of the diversion, those centers were shipping less into the Northeast, so that burden fell on Midwest distribution centers in Ohio and Illinois. Now, with much of the Southeast and Gulf still in recovery, the inland distribution of cargo has fallen squarely on the shoulders of unaffected logistics hubs farther north and inland. According to DAT Solutions, only two US states have reported even a sizeable amount of trucking capacity: Arizona and Nebraska, and then only for refrigerated and van cargo. “It’s going to be a test of the system’s resiliency,” said Montague. At the very least shippers should expect tight capacity and historically higher rates through January of next year, said Troy Cooper, chief operating officer at XPO Logistics, the second-largest US less-than-truckload carrier and a leading truckload freight broker. Contact Reynolds Hutchins at reynolds.hutchins@ihsmarkit.com and follow him on Twitter: @Hutchins_JOC. Senior editor William B. Cassidy contribute to this story. Contact him at bill.cassidy@ihsmarkit.com and follow him on Twitter: @wbcassidy_joc. © HYC Logistics. All rights reserved.